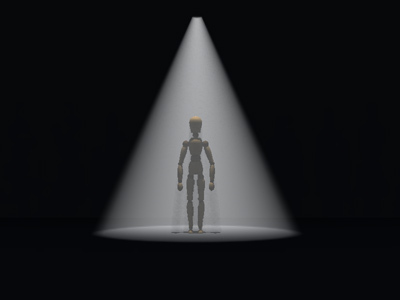 One of the simplest lighting rigs used in a theatre is a single spot light directly above a figure. This image shows the principal of this set up. I’ve placed the light closer to the top of the actor than a real light would ideally be placed. By placing the light higher a narrower beam can easily illuminate the whole width and depth of a person. Light falls mainly on the top of a figures head, the chest and the shoulders. little light falls on the front of the face leaving the eyes, mouth and nose all in shadow. This lighting rig shows none of a character’s expression for most poses. 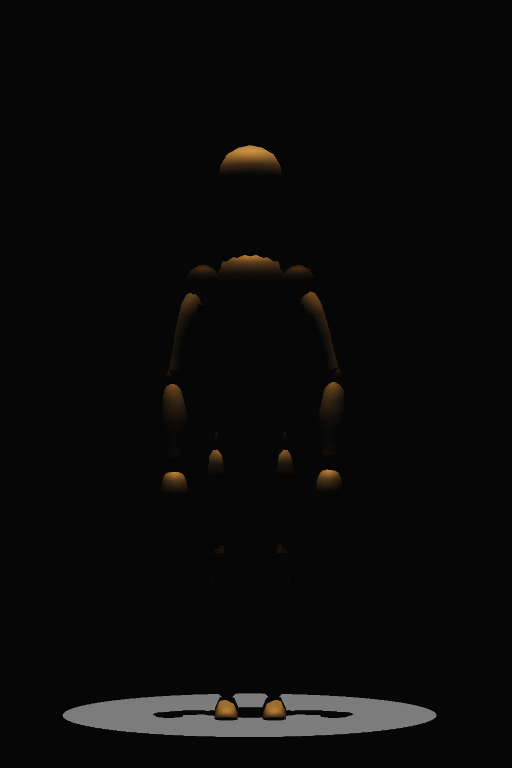 Shadows from the head, arms and chest can fall in an unnatural way on lower body parts. All of the above images were made using Poser 7 and Vue 8 Infinite. It could have been made using any version of the current versions of Vue since Vue 6.